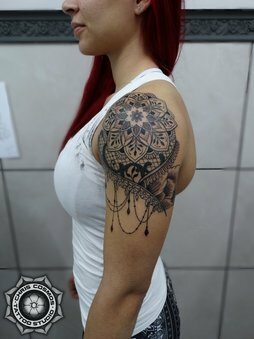 Chris Cosmos Tattoo Studio was established in 2012 by artist Christos Tziortzis after a long lasting passion & urge to express himself through art. We are proud to welcome you inside our tattoo studio and inside the world and life style of tattooing. My name is Christos Tziortzis . I was born and raised in Limassol. After studying the art of tattooing for many months, and having the opportunity to work under great mentors and together with some amazing artists, I finally came back to my hometown, and opened a brand new tattoo studio, providing my skills and artistic talent, in PERMANENT BODY ART. We have an extensive background in fine arts, painting, drawing and more. We specialize in neotraditional, illustrative, geometric tattoos, and custom art. We also do all kinds of tattoos from Tribal, Japanese, Maori, Photo-realism & also specialize in Custom Work. Just bring us your basic idea and we can tweak it and make it fit with your personality and needs. We work with the latest technologies and machines in tattooing. We are also proud holders of a Nursing Diploma, and proud of our High Hygiene Principles & European Standards. You can come in to our studio and discuss with us about the design you are thinking to do, the placement etc. We will provide you with the best ideas and choices, free of charge. At Chris Cosmos Tattoo Studio located in Limassol Cyprus, we pride ourselves for professional, high quality tattooing and strict hygiene standards. We do NOT tattoo persons under 18 years of age, and do NOT accept Parent Consent. If you are underage, we advise you to wait a bit until you are older and more mature, before you put permanent ink under your skin. Your body is still going through changes, especially growing and getting taller. 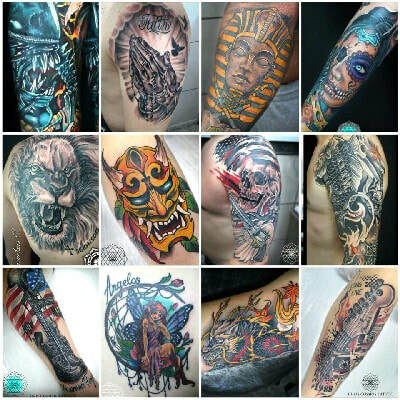 For Returning Customers, and big tattoos such as full sleeves, back pieces, etc, we offer bigger discounts. We are also available all the other hours and days of the week by appointment only. about our studio and work.